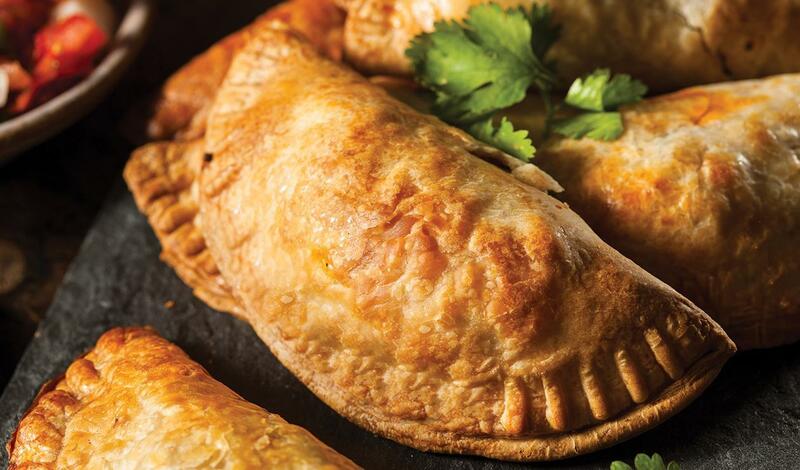 These empanadas are stuffed with traditional beef picadillo of Latin America and Spain. They are fried until crisp and make a great shareable appetizer. Preheat a large saucepan over medium-high heat. Add the ground beef and cook until no longer pink and cooked throughout. Transfer with a slotted spoon to a bowl and set aside. Drain and discard most of the fat from the pan, leave just enough to coat the bottom of the pan. Add the onion and bell pepper and sauté until translucent. Add the garlic and cook another 30 seconds. Add the black pepper, Caldo de Pollo, cumin and oregano. Add the tomato sauce, beef base (unprepared), and sherry and stir to combine. Add the olives and raisins and the beef back to the pan. Simmer, stirring occasionally, until liquid is reduced but mixture is still moist, about 10 minutes. Spread the mixture onto a baking sheet and place in the refrigerator to cool. Place the empanada disks on a work surface and using your hands, thin them out slightly. Place about 3 Tbsp of the beef mixture in the center of each disk. Moisten the edges with water and fold over to form a semicircle, then crimp with a fork. Deep fry the empanadas at 360°F, turning once, until crisp and golden, 4-6 minutes per batch. Serve warm. Makes 2 empanadas per serving.